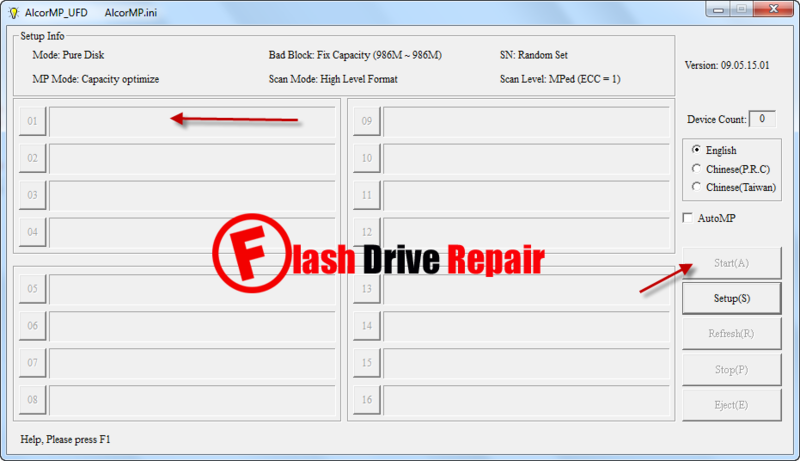 Repair Damaged ALCOR USB flash drive chip controller.Download AlcorMP UFD V9.05 format tool for repairing Alcor AU698X and AU3150X chip controllers . AlcorMP UFD V9.05 utility is designed to format corrupted Alcor USB flash drives .AlcorMP UFD V9.05 format tool can update firmware of the following Alcor controllers "AU6981, AU6982, AU6983, AU6984, AU6986, AU7640, AU3150B51, Au3150C53 " .If you face flash drive recovery or format errors such as write protection problems or unable to format your corrupted USB flash disk , so you can use AlcorMP UFD V9.05 recovery tool for fixing this problem . You must be sure that your USB flash drive is one of the following Chip controllers "AU6981, AU6982, AU6983, AU6984, AU6986, AU7640, AU3150B51, Au3150C53 " .You can use Chip genius report software or USBDeview V2.30 utility . Download AlcorMP UFD V9.05 software from the download links in the bottom of this article . Insert your Corrupted Alcor USB flash drive controller to your computer . Open AlcorMP UFD V9.05 formatter and if you see your flash drive information appears on the program interface , this means that this software support your USB flash disk . Click Start to begin updating your USB flash drive firmware . This works on my Wintec Flash Drive as far as the firmware was concerned, but that is not the problem. The device still says, Device is Write Protected. There is no switch. I've tried everything online, and believe the device storage was corrupted by either Yumi or Bootice. The problem actually occurred on two identical Wintec Flash Drives with the Alcor chip. I was advised to NOT buy Wintec Flash Drives because they offer no tool to fix their own products.